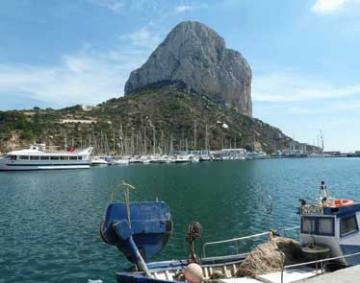 Holiday villa with private swimming pool located 3 km from the beach and centre of Calpe on the Costa Blanca. Villa accommodation covering 120 m² for 8/9 people, 4 bedrooms, 3 bath/shower rooms, wifi, satellite television, air conditioning. The house interior comprises a comfortable living and dining room along with a separate, well-equipped kitchen (with dishwasher, oven, microwave...). Four double bedrooms. Possibility to add a single put you up bed. Bathroom and two shower rooms. The grounds cover 400 m² and there is an eight-metre long pool with loungers poolside for relaxing and enjoying the sun. For eating outside you have a covered terrace with table and chairs in the shade, there is a barbeque too. The sea is 2 km at the El Mallorquin creek. La Fossa sandy beach 3 km. Shops and restaurants 3 km. Alicante airport 75 km. Valencia airport 130 km. Security deposit: 200 € to provide on arrival. - Compulsory supplement to be paid on arrival: 180 €, including linen, final cleaning and wifi. - Cot: 25 € per week. - Air conditioning package: 10 € per day - Extra bed if accepted in the villa: 90 € per stay. - Pets allowed on request: 45 € per stay. Supplements must be paid on site by cash or credit card upon arrival.